For the past few months, a lot of good offers have been showing up from popular GSM providers in Nigeria, starting from Airtel N200 for 4.6GB data plan, Glo N100 for 5.4GB data, 9mobile N500 for 4.5GB data, MTN mPulse that Offers 1.2GB for Just N150, MTN free 756MB Data via MyMTN App and Dent unlimited free data bundle . Only who can not sacrifice a little amount of money for the best internet data plans are lacking behind this day. Here is another huge awoof data bundle from MTN Nigeria through WeChat social bundle. Note that this is not a normal promo, you can call it tweak or data by error. Unfortunately, it doesn’t work on all MTN SIM cards, but it works better on MTN old sim cards than new MTN sim cards and the only way to find out if it works is for you to sacrifice N50 airtime. This 5GB data for N50 is made possible by the MTN WeChat social plan. WeChat is not a popular social media platform in this part of the world, but it might become popular all thanks to this plan. Recharge your MTN sim card with at least N50 airtime, ignore this step if you already have at least that amount of airtime on your MTN SIM card, there’s no need to purchase the airtime. Dial *662# and follow the prompt by replying with 6 >> 2 >> 1. 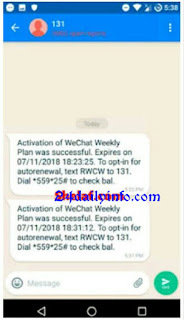 This will subscribe you to the WeChat weekly plan. Now, dial, *131*4# to check your data balance. If your SIM card is eligible, you should see 5120MB data, valid for 7 days. To check the expiry date, dial *559*78#. To Accumulate Your Data You can subscribe and re-subscribe to WEChat, e.g. you can subscribe to the plan 4 times at once. This means with just N200 you can get 20GB. The data works for all the device, even on the PC without any VPN. Enjoy it while it last. Comment on "MTN New Awoof Data Bundle: Get 5GB for just N50, 10GB for N100 or 20GB for N200"